Part time call centre jobs are a great way to make some extra cash while you are studying. The hours involved are usually very flexible (sometime including evening or weekend work) and the pay can be reasonable these days. Call centre work has sometimes had a bad press for being repetitive, stressful or badly paid. Other former call centre workers have complained about poor working conditions, lack of privacy and a noisy office environment. The good news is that many companies that use call centres or contact centres have taken on board what their own staff or other businesses’ staff have said, and tried to improve conditions for call centre work. Indeed, some of the big companies now have facilities such as pool tables and TV rooms so that their call centre workers can chill out on their breaks or before and after their shifts! The levels of pay on offer for call centre work have also improved over time. There is a good chance that there will be a call centre or contact centre near to where you are studying, so this sort of work is a really good option for students who want to earn some money while picking up some work experience. What Does A Call Centre Job Involve? Most call centre work that students undertake involves dealing with inbound calls. This means that you will likely be answering phones to a business’s customers. It could be that you will be dealing with complaints from the public, but equally you could be helping someone with product support or offering advice on a range of subjects. 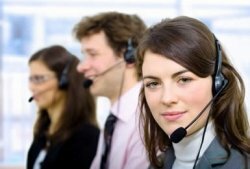 These are commonly known as customer service call centre jobs. On the other side of the coin, some call centre work involves outbound calls. These sort of jobs are less frequently filled by students, but if you are interested in this sort of work then you could be working as an agent for a company, trying to make sales over the phone for them by telemarketing. Many call centres provide a mix of both inbound and outbound calls and there is often a hierarchical structure to the workforce where newer staff pass calls upwards to the more experienced call centre workers. In addition to call centres, some businesses also use contact centres which offer support to customers via other channels than simply telephone. If you find a contact centre job then as well as dealing with customers via telephone, you could be interacting with them using email or live internet chat. One of the best things about doing a stint in a call centre job (even if you don’t fancy the work as a permanent career) is that there are lots of transferrable skills you will pick up. Is It Easy For Students To Get Call Centre Jobs? Well, if there are call centre job vacancies in your area, then students have a great chance of securing a position since they can usually work flexible hours. But where do you start to look for these sorts of call centre jobs? Well, ask around your friends or family to see if they know of any big call centres that have premises in your town or city. If they are hiring, then get your CV in front of their eyes.